Though it rarely seems to be planned that way, some young men just naturally end up working with their dads. 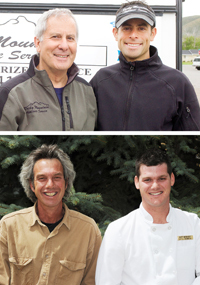 Several Wood River Valley businesses are father-son partnerships. The owners of three of those businesses discuss the perks and pitfalls of keeping it in the family. Justin Larson, 38, says he "just kind of stumbled into" working with his dad, Dwain, 64, in 1999 after trying to put his business degree to work as a stockbroker, an insurance agent and a car salesman. At the time, Dwain had a solo operation doing janitorial work and building maintenance. Now the business has 15 employees and has expanded into repairing homes damaged by water and other disasters, assessing damage for insurance companies and cleaning carpets. They've got an in-house carpenter, drywall installer and painters. "I just started working with him and saw a lot of potential," Justin says. Dwain had the practical experience and the business connections, but wasn't interested in doing the managerial work needed to allow the business to expand. He says it was Justin's new ideas and energy that allowed it to take off. "It's where it's at today because of him, not because of me," Dwain says. "The egg was there but he hatched it." On the other hand, Justin says, the business wouldn't work without a partner he can count on to take care of things at a moment's notice wherever and whenever it's needed. "When you're in the disaster business and the phone rings, it's time to go," Dwain says. Like other father-son partnerships, this one only works because the two think alike on most things. Justin says that makes it easy for employees to know what to expect. He also says the partnership's probably good from a customer's perspective. "I think there's a certain comfort level that a father-son business is going to deliver good quality," he says. Dwain says he always had a dream of owning a business with one of his sons. Now that's he got that, he says, he has no plans to retire. Even when he does, he says, he'll probably always be around to offer advice—"until he says, 'No, stay home!'" Justin appears settled in for the long haul as well. "I feel pretty blessed overall," he says. "But someday, this chapter, too, will pass, so it's time to capitalize on it." Michael Hobart, 54, says he learned a long time ago not to have a partner. He says he likes to have total creative control in his interior and exterior stone and ceramic installations. But when his son, Jeffrey, 29, moved to the Wood River Valley from a stint working as a chef in Colorado, he decided to take him on. It was a natural step from the time Jeffrey worked with him as a teenager to earn pocket money. "Having worked with me for so many years, he knows what pushes my buttons," Michael says. "It's not as frustrating as working with other people." However, he says, he's found he enjoys the opportunity to spend more time with his son. "It's working at a task or goal together. You get to know your kids—you find out things that you would otherwise never find out about how their lives are. I see Jeffrey growing and flourishing." Michael says that working with his son, he has to be careful about not being too critical of his work. "I need to just let him do the work and figure it out for himself—otherwise you get the father-son friction thing going." "Some weeks he gets a paycheck, and some weeks he doesn't," Michael says. Jeffrey still puts his culinary arts degree to work three days a week at several Sun Valley Resort restaurants. Michael and Jeffrey also recently expanded into a snow removal service. Michael says Jeffrey took the initiative on that one. Another new project is a vegetable and herb business—one that's adding another family member, Jeffrey's wife, Jenna. Michael said he installed the automated greenhouse in the backyard, but she's the one with the botanical knowledge. "I'm the grunt," he says. "Jeffrey and I do all the hauling of dirt and transplanting." As with many people in the Wood River Valley, the multiple jobs are needed to pay the high cost of living here. And in this case, Michael hopes, to ensure that a family that works together will stay together. Customers love father-son businesses, says Joe Yelda, 62, because whenever they call, they get to speak to an owner. Moreover, they feel comfortable with the long-term stability that family businesses generally have; after 29 years in business, Joe's finding himself repairing appliances belonging to the children of his early customers. There's a nice benefit to the business owners, too—Joe and Paul, 33, can trade off vacation times knowing there's someone reliable in charge while they're gone. During the past two years, Joe spent five weeks in New Zealand and Paul spent five weeks in India. Joe had a brief career teaching school after earning a teaching degree from San Diego State University. But after being shocked by the low salaries proposed to him for teaching jobs, he went to work for Whirlpool as a service manager in Idaho Falls. When Whirlpool later proposed to relocate him to the Midwest, he said "no thanks," and moved to Hailey instead to start his own business. Now Joe works Mondays through Thursdays, and Paul works Tuesdays through Fridays, both of them often putting in 10-hour days. Theirs is a recession-proof job; in fact, Joe says, since the economic downturn, customers are more often asking him, "Can I get a couple more years out of this?" Joe says that with increasing social emphasis on children going to college, father-son businesses in the trades aren't as common as they used to be. That's a shame, he says, because that type of business, if done correctly, can provide both a good living and pleasant working conditions. "People say, 'You guys have the best working relationship of anybody I know.'" Joe said he isn't even thinking about retiring. "We haven't even talked about that," he says. "We're loving how it's worked out."